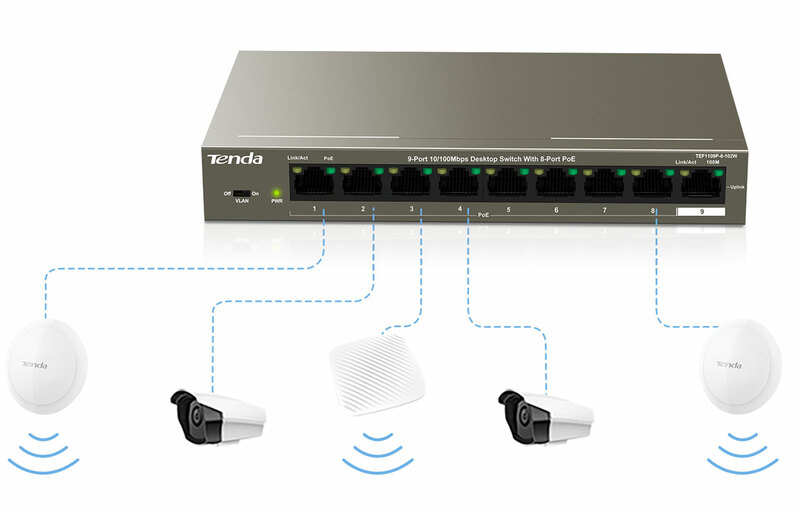 TEF1109P-8-102W is a Tenda switch that offers 9 10/100M RJ45 ports. Ports 1-8 comply with the IEEE802.3af standard (maximum PoE power output : 15.4w) and 802.3at standard (maximum PoE power output: 30W). The switch offers a maximum PoE power output of 92W and can supply power to exchange data with APs, IP cameras, and IP phones through CAT5e cables. It also provides simple management modes such as Standard, VLAN. Thus, F1109P-8-102W is a perfect choice for SMBs, hotels, and office to have small-scale HD surveillance and wireless networking. With the extension technology,data can be transmitted through 250 meters cable which would be a cost-effective replacement for extenders and optical fibers. The switch supports 6 kV lightning protection for uplink port, protecting the switch from thunderstorms and making it more stable. With VLAN Mode on , ports 1 to 8 are isolated from each other, enabling the switch to isolate broadcast storm, improving LAN security and data transmission. Equipped with 1024KB large packet buffer, it ensures smooth streaming even when eight HD IP cameras of 500W are working simultaneously. It includes chips with smart power management function and integrated professional chip control algorithm, which can accurately calculate the output power. When the power of the receiving equipment exceeds the rated power (92W) of the PoE switch, the low priority port will automatically power off to avoid the over-run of the equipment and prolong the service life of the equipment. Keeps Overloaded Running Away,Extends Life of the Device. Overloaded Power Supply,Short Life of the Device. Ports 1-8 support IEEE 802.3at and IEEE 802.3af PoE standard. It provides 30W maximum PoE output a single port and 92W the whole device.